So I love listening to the radio show of Pastor Greg Laurie. He pastors a very large church in Riverside, California. He will often make mention that he has a face for radio in sort of a self deprecating manner. This got me wondering that since I do an Audio podcast, do I also have a face only fit for radio? This got me thinking back to my teen years and an incident that occurred out on the tennis courts in which a girl around my age asked me to take off my sunglasses and when I did she responded with a deflating, “Oh” as if to say “well that was not what I was expecting.” Talk about deflating! Well anyway, my photo is on the website at www.theremarriedlife.com. You can be the judge but go easy on me! 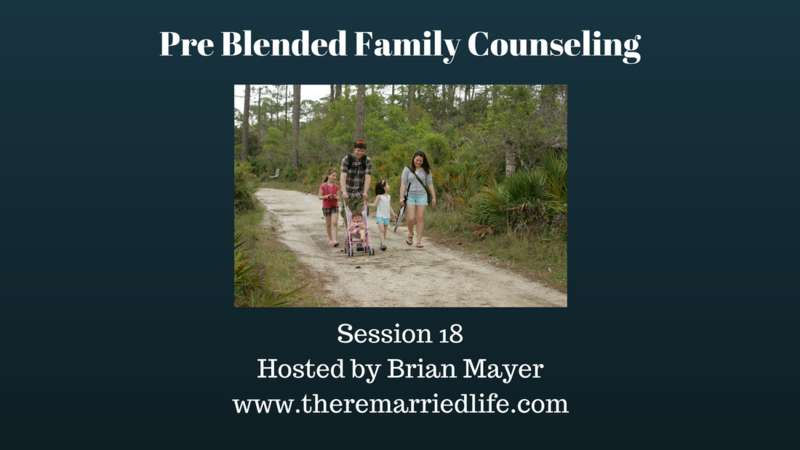 Today’s episode is all about Blended Families getting counseling before the Blend occurs and how important this is. Gonzales wrote the article while at the Department of Psychology at the University of Alaska Anchorage. Blended families and couples need counseling probably more so than do pre-marital couples that have never been married and first time married couples. The blended family situation is so complicated and then people are sort of thrust together with a period to get to know each deeply. It is like learning on the fly. Gonzales proposes 4 stages to the Pre-Blended Family Counseling. Discovery Stage – Discovering Each Family Member. Again because blended families are often thrust together, this stage of counseling is important. It gives each family member the opportunity to learn more about each other. He proposes an interview of each member during the counseling with such simple questions as “What is your favorite food” to more meaningful questions such as “What is your dream job.” He also discusses getting to know personal habits such as whether or not the individual is a morning person and how much affection such as hugs do they like. Bonding activities are also important during this stage. He gives an example of everyone helping to make a family flag by each person drawing something special on the flag that is meaningful to them. Educational Stage – The therapist might assign reading such as books that discuss a specific family’s blended family experience. Children’s books on the subject are also very helpful. Podcasts like this one can also be helpful for couples and families to learn more about the ins and outs of remarriage and blended family life. Education on normalizing the experience is also important in counseling. Letting each member know that combining families is not easy and will not be perfect. This sometimes has little to do with the specific people involved but more about the complicated dynamic. One thing that does get lost is that children not only have to adjust to different rules and expectations in one household, but they also have to adjust to a second household. Time and patience should also be taught in the counseling sessions. Most researchers state that blended families take 5-7 to come together in a strong enough manner to operate like a biological nuclear family. Parental Unification – The couples needs to discuss their views on parenting before coming together. This includes expectations on discipline. It also includes expectations on interactions with former spouses. The sessions on this piece need to give lots of time for each adult to be able to talk about their feelings on all of these matters. It is important to get these out in the open so that each person can work on how to bring this together before the households are combined. Gonzales cites some other researchers in saying that when blended families are first formed, each parent should be the primary disciplinarian of their own children, but at some point there should be a gradual move to disciplining of stepchildren. In these sessions, there would be some time devoted to the adults working on unifying, but then the children would be brought in to discuss and understand what the parents have decided regarding expectations and discipline. Family Unification – This is the final stage of counseling for the pre-blended family. Simple listening and validating feelings of children are important at this stage. If children are interrupted etc at this time it can lead them to shut down more than they may already be prone to. These sessions in which the counselor teaches these communication skills should also be used at home during the family meetings. Most blended families are thrust together, but this type of counseling can be important to establish a more healthy unit. Most experts recommend 10-12 sessions to ensure all areas are covered and that each member can feel confident as they discuss and practice what life will look like outside the sessions.